Can I use my spam filtered account during the transition? YES, keep using your account as you normally would everyday until we notify you. Will I lose my email address? No! Your email address will not change. How do I access my account after the switchover? If you login via webmail nothing will change at all in how you access your account. If you access your email via a mail client like Microsoft Outlook or Mozilla Thunderbird, these clients will automatically grab the correct settings to make it as painless as possible to set up. Smartphones will require some settings changes, but we’ll have detailed guides on our website to help you out. What in my account will be migrated? Your email and contacts will be migrated to the new platform. Can I access my new account now? No, we will notify you when your new account becomes available. How much time is required to set up my account? You’ll be able to master the basics — sending and receiving email and viewing and scheduling meetings — very quickly. If you are using an email client such as Outlook or Thunderbird, you will need to remove and add the account again fresh. It will automatically pull the correct settings for you and synchronize your mail again. You may reference our configuration guide to walk you through the configuration settings if you run into any problems. And you can always just give us a call at 573-443-3983, and we’ll walk you through it over the phone. Gmail and Tnetmail offer you the option to have a default signature that places itself at the end of all your sent emails. The following steps and video explain how to create and customize this signature. When logged into your Gmail, click on the settings gear in the upper right hand corner of the screen. Click on “Settings” in the drop down box. Go to the “General” tab and scroll down to “Signature.” Highlight the bubble next to your name and email address. Make sure the desired email account is displayed. Type your signature into the text field. You should at least include your email and phone number. Usually, you will also want to include your company name, job title, and web address. Your address and a fax number may also be helpful depending on your business. If you would like to hyperlink your web address, simply highlight the address and then click the link button on the formatting bar at the top of the text field. You can edit the font of your signature with the options in the formatting bar. Gmail gives you a limited number of font types to choose from because these fonts are compatible on any computer and with any email service. Then check the box below the text field to make sure your signature will be inserted before quoted text in replies. When you are all finished, scroll down and click on “Save Changes” at the bottom of the settings page. Keep on the lookout for a video on how to upload and insert an image into your Gmail signature in the near future. Adding a signature to your Tnetmail account is done in the exact same fashion as Gmail. If you are interested in using Tnetmail, contact Tranquility for information. Use Your Email Signature as a Marketing Tool. Sometimes its hard to remember that your email works for you – and that you don’t work for you email. Have you ever thought about the amount of of time you spend composing, reading and incessantly checking your email? A great way to get a extra mileage out of those messages your sending is by adding a little umph to your email signature. Yes, that little section of contact information that most people ignore. WiseStamp is an email application for Tnet Mail that could change your perception of email signatures and turn yours into a marketing tool for you or your business. With WiseStamp, you can add your latest Facebook post, a button to connect the recipient to your LinkedIn profile, a link to your blog, your photo or logo and more. 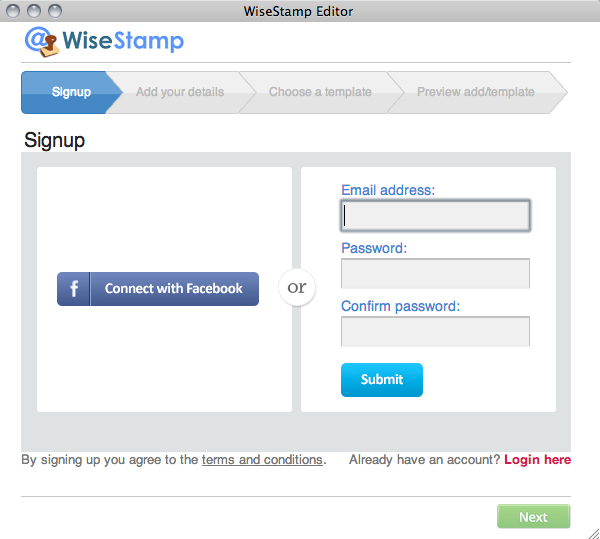 Open your Chrome or Firefox browser, and go to wisestamp.com. Click the Free Download button. Follow the prompts to complete the installation. Then, if you are using Firefox, restart your browser. A pop-up window will appear, prompting you to begin your editing process. Click Start Now. Create an Email Alias in Tnet Mail. Email can get messy. But Tnet Mail clients can use aliases to keep their webmail accounts organized and centralize all incoming and outgoing mail. An email alias is a virtual address that redirects to your preexisting email account. For example, if Jane Doe got married to John Newlywed and wanted to change her old address, janedoe@tnetmail.net, to something including her new surname, she wouldn’t have to create a new account. She could simply set up an email alias, called janenewlywed@tnetmail.net, for her old account. 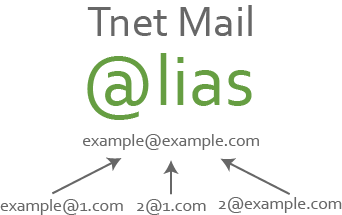 Each Tnet Mail user can set up 30 different email aliases. Before you go diving into your Tnet Mail account, though, look over the steps below. Setting up an alias requires the work of both your Tnet Mail administrator and you, the user. Sign in to the Google Apps control panel by going to https://www.google.com/a/cpanel/primary-domain-name and tacking on your domain name to the end. Enter your sign-in information for the admin account. Locate the account you would like to add an alias to by entering the username in the search box at the top of the control panel and clicking Search accounts. Select the row for the user account to display the user information page and click Add a nickname. Enter the new alias name (what comes before the @ symbol) in the Add a nickname text box and select a domain from the drop-down list (what comes after the @ symbol) for the alias. Click Save changes. Within 24 hours, the alias should be ready to use. Go to Settings by clicking on the wheel button in the top-right corner of your inbox. In the menu across the top of the page, click Accounts. In the section titled Send message as, click the Add another email address you own link. A box will pop up, prompting you to enter the Email address you would like to use as an alias. Enter the alias and click Next Step. Continue to click Next Step on the following prompts, choosing your settings as you go, until you reach the option to verify the new alias. Click Send Verification. An email will be sent to your inbox with a link and confirmation code. Click on the link and enter the confirmation code in the setup window. If you followed the steps correctly, you should be ready to start sending and receiving mail with your new alias! You will still use the primary address to log in, receive calendar invitations, sync with your mobile device and share Google Docs and Sites, but can communicate with coworkers and clients using your alias. To learn more about Tnet Mail and the support it can offer your business, visit our webmail page or contact Tranquility today. Browse the latest support articles at left, or if your question isn't covered in these topics, search our support center. We're a new kind of old school. We do house calls. And business calls. If you'd rather save yourself some time and energy, we can come set up and fix stuff for you. Visit our remote support page for pricing information.